Instructions: Create a 6" x 6" card base from white card stock. Locate premade card panel within Burst of Spring Paper Collection, trim down slightly to fit card base, ink all edges of the preprinted card panel using Ranger Archival Ink - Deep Purple. Adhere to card base. 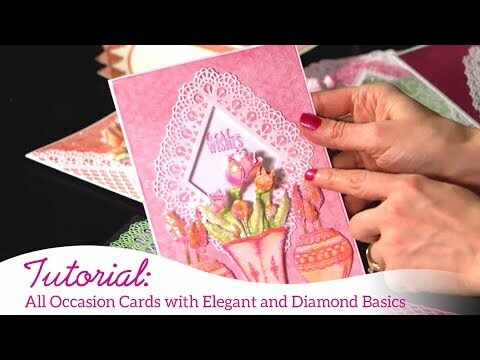 Die cut the lacy diamond accent from white card stock using die cutting machine and Lacy Diamond Die. Choose a soft hued decorative paper from the Burst of Spring Cling Paper Collection, using a coordinating sized diamond from the Diamond Basics Die, die cut to fit center of lacy die cut. Using Ranger Archival Ink - Jet Black, stamp sentiment from Cheerful Note Sentiments Cling Stamp Set into center of diamond. Stamp one inking of the Petite Pansy Frame Cling Stamp Set, and one inking of large and mid- sized pansy petals, as well as foliage, onto white card stock using Ranger Archival Ink - Jet Black. Using Stack and Store Daubers, color all pansy centers using Ranger Archival Ink - Sunflowers, Ranger Archival Ink - Forget-Me-Not around centers, and Ranger Archival Ink - Deep Purple on petal tips, working the blue and purple colors into one another. Using Stack and Store Daubers, color diamond shape on illustration using Ranger Archival Ink - Sunflower, and all foliage with Ranger Archival Ink - Olive. Die cut all stamped images using coordinating dies. Using 3D Pansy Shaping Mold, shape one large and one mid-sized pansy, along with both sizes of foliage. Adhere sentiment diamond die cut to back of Petite Pansy Frame Die Cut. Apply dimensional foam tape to back of Petite Pansy Frame die cut and adhere to lacy diamond die cut. Apply dimensional foam tape to back of lacy diamond die and adhere to card base. Adhere large foliage and large pansy to top side of diamond shape as shown. Adhere small foliage and mid-sized pansy to bottom of diamond shape as shown. Using a fine metal glue tip and Dries Clear Adhesive, apply Crystal Ultrafine Transparent Glitter to all preprinted and shaped pansies, as well as foliage. Adhere prills to shaped pansy centers.